The Emerald Tree Boa is an attractive species, but experience is required in keeping snakes before adding them to your collection. What does an Emerald Tree Boa look like? 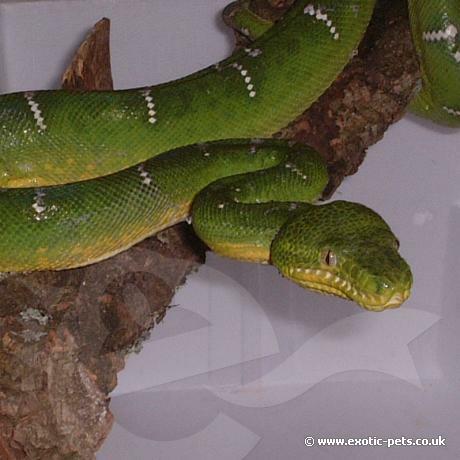 Emerald Tree Boas reach an adult size of 6 feet, with a 10.5 feet record. Young Boas may vary in colour from red or orange to yellow with white bands across their back. As they age, their colour will change to a bright green. This happens scale by scale, normally with the head changing first. Deep pits are noticeable on the upper and lower labials (lip scales). Where are Emerald Tree Boas from? They can be found over quite a large range covering much of Northern and Central South America. Found in rain forests at the Amazon basin and forests of drainage systems in Colombia, Ecuador, Surinam and the Guiana. They can also be found as far North as Northern Bolivia. Are Emerald Tree Boas easy to keep? Experience with snakes is a must as this species can be difficult to keep and have a reputation for being aggressive. Firstly, a custom made vivarium will be required, these Boas require height than floor space. You can make a vivarium from plywood or Melamine with a Plexiglas hinged door. You can also purchase Exo Terra Flexariums with the Flextray, these have the ventilation which is a must for this species. Caution should be taken as it has been reported that some snakes have been know to push through them - we do not know how true this is! The high vivarium that is required needs plenty of air circulation, but can also maintain the high humidity levels. An adult Boa should be housed in a minimum of 24x24x48 inch but a bigger enclosure would be better. Humidity should be kept above 70%, these snakes can dehydrate if kept too dry that can causes health problems. A daytime temperature of 75-80F should be provided with a basking spot between 90-95F. Some breeders do use a UV light, these snakes would be exposed to this in their natural environment. Lighting should be provided with 14hrs in the summer and 10hrs during the winter. The biggest challenge is the correct humidity levels. This can be maintained in a number of ways. The easiest and best-kept methods would to use either a misting system or a fogger. You can also use a substrate that will hold moister but not go mouldy. Newspaper, cypress mulch or reptiles bark is used by many keepers, some breeders place an inch of water in the bottom of the enclosure. The last method can only be used in waterproof container such as plastic or glass enclosures. Horizontal branches of at least 5cm (2 inches) thick should be placed throughout the enclosure at different heights. Birds nesting boxes or cork bark branches make a great hiding places. These can be useful when your snake is due to shed its skin, add vermiculite or moss and this creates a humidity hide. In the wild Emerald Tree Boas would eat rodents, birds and frogs. In captivity, defrosted pre-killed rodents and birds can be fed once a week to young Boas and then every 11-14 days as adults. Fresh water should always be provided, but they rarely drink from a bowl, they get water droplets off their scales that’s produced by the high humidity in the enclosure.